The Well Marked Low Pressure Area off the Andhra Pradesh Coast continues to linger on giving some good rains to South AP. Chennai got missed out on the rains with slightly more West movement than the WSW movement that was expected from it. The disturbance that was expected to move from South China Sea has crossed over Malayan Peninsula and is now in the Andaman Sea area. The disturbance has entered into possibly an area which could see the best conditions in its life cycle, Low shear and a good Sea Surface Temperature around for it to build momentum. 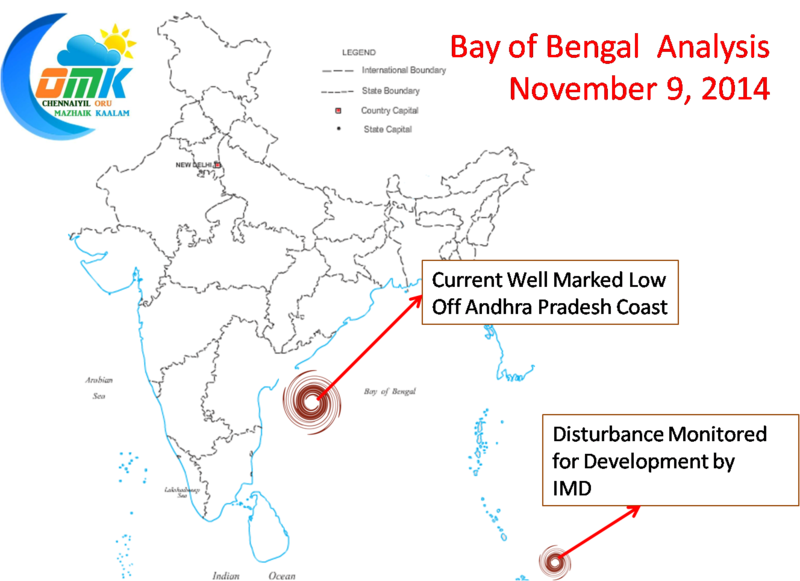 As it moves in a WNW direction towards the Andaman Islands it is expected to encounter moderate shear, though showing marginal decreasing tendency, with land interaction and moderate wind shear the disturbance is going to find it difficult to build momentum as it crosses the Andaman Islands. But crucially for it Bay of Bengal seems to have gone into sleep mode in terms of supporting the system through Ocean dynamics. The Tropical Cyclone Heat Potential seems to be showing decreasing tendency all along its path towards the Indian Coast. As things stand this disturbance is not going to have the best of the times for itself but it may provide some decent rains to the Southern Peninsula as the week progresses. Crucially we also have to track what influence the existing WML is going to have on the incoming disturbance as it stays on for longer.